Mexico’s beach resorts have long been a favorite for foreigners seeking warm, carefree vacations. Simply book an air/land package that includes hotel, decide whether to include all food and activities, and show up at the airport with your passport. No research required, only sunscreen. The Mexican government recognized a good thing when they saw it, and in the 1960’s, Cancun and Ixtapa were developed to attract tourists on the East and West coasts of the country. Not included in those developments were many private ones, including Puerto Vallarta and Acapulco. Over the years, the number of hotel rooms outpaced foreign travelers and more visitors were needed. Enter the emerging Middle Class of Mexico. Ixtapa was chosen for a Thanksgiving family reunion as one of my brothers has had a time share there for many years. November is considered part of the off-season for Mexican resorts and during the week, the resort was quiet and space readily available. Because of the low census, the hotel made needed repairs in anticipation of the approaching high season. All employees talked of “poca gente” – few guests. But all that changed on Friday. As we walked out of the hotel lobby that morning, three tour buses arrived, carrying families from Mexico City. More came through the morning. Some children wore sweat pants, indicative of the colder climate of their hometowns. The hotel, restaurants and pools filled up. As the closest resort to Mexico City, a metropolis of 26 million inhabitants, Ixtapa is the obvious choice for a week-end of sun and sea. Mexico has been enjoying a surge in the ranks of its middle class. Thanks to the booming free trade with the United States, Mexico has the 13th largest economy in the world. Education has been emphasized with almost all children between ages 5 to 14 in school. As the fertility rate has dropped dramatically to two per mother, more women are working. In a series of articles on the middle class of Mexico by Washington Post writers Nick Miroff and William Booth, they found admiration for our southern neighbor from economists. It has controlled inflation, balanced its budget and managed debt. The middle class has also been helped by entrepreneurs who have returned from the United States, bringing saved money to start their own businesses. 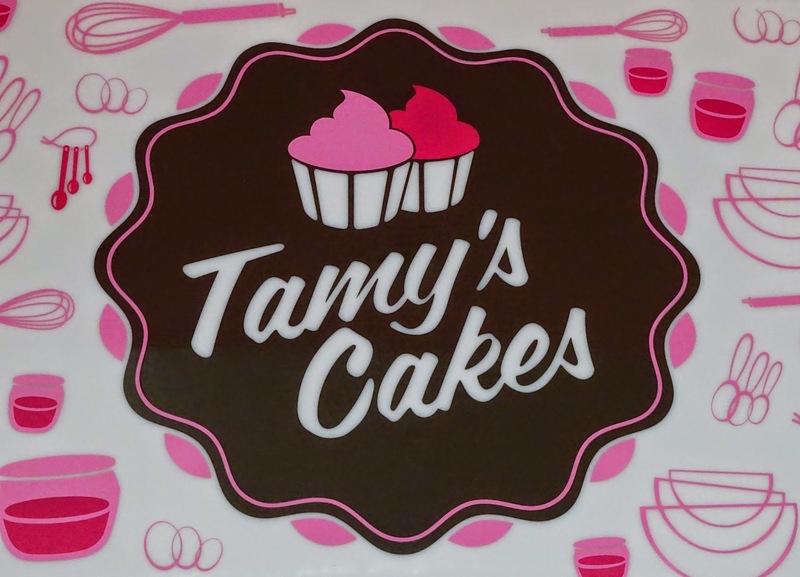 They were illegal in America but heroes at home – sending money back for food and shelter but saving enough to return to use their acquired business acumen. Their reclaimed lives will not look like the middle class of developed countries but they are no longer in poverty and can now be assured their children will not want to cross the northern border to find jobs. I visited with Michael, our resort’s time share supervisor about the uptick in the week-end census. Most guests come on week-end packages costing about $300 per couple for three nights with food. Children would cost a bit extra. While economic by our standards, only the middle class of Mexico could afford such an excursion. Beginning in December, Ixtapa’s resorts attract more American visitors, especially from the Mid-West, as well as many from Canada. The closer to Mexico a U.S. state was, the fewer visitors came. Michael laughed and said they never get anyone from Arizona. Newspapers from border states carry more drug cartel stories, scaring many away. Yet, the “tourist bubble” still holds in almost all Mexican resorts and Mexico works very hard to keep them safe. The new crowds didn’t affect our schedule much. We’re that kind of American tourist who get up early, are the first to walk on the beach, and retire after dinner. Restaurants were often just opening when we arrived. But later, lines would be out the door as our Mexican friends enjoyed dining at their traditional, later hours. It was a pleasure to witness a part of the transformation of Mexico. With such beautiful beaches and resorts, its citizens should be visiting them. I only wish more in the United States could realize that not every Mexican wants to come to our country. Millions are content to be a part of Mexico’s emerging economy, especially when it comes with a beautiful beach. 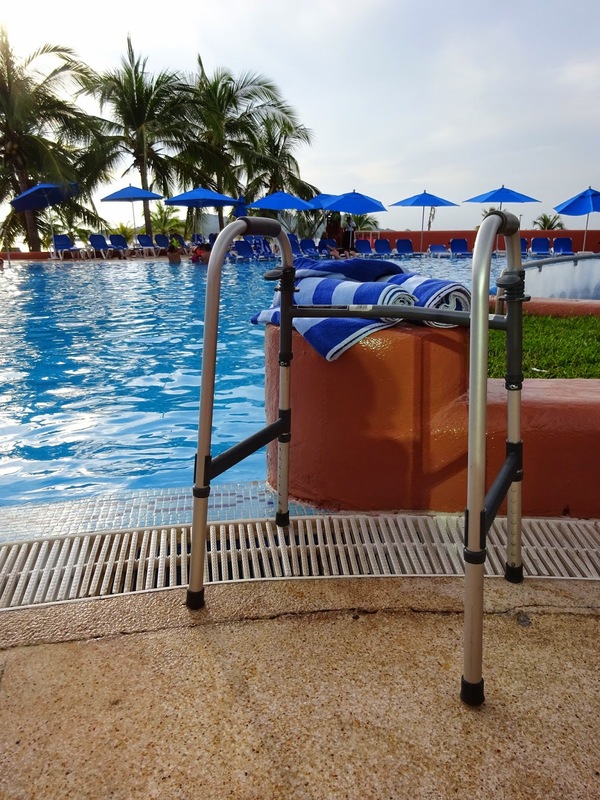 Traveling in Mexico with a Disability. I never expected to travel as a disabled person, at least not yet. 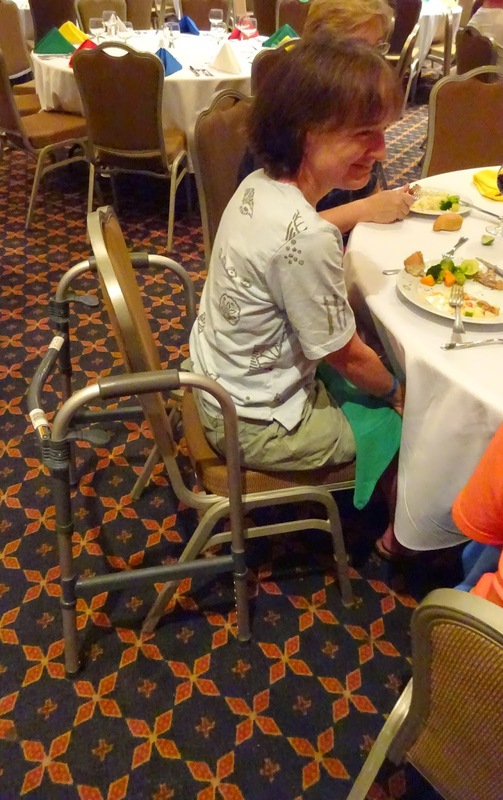 There was no need to pay attention to travel writers who specialize in places catering to those needing assistance. I knew the Americans With Disabilities Act applied to travel as I had seen the ubiquitous wheelchair signs for close in parking at the Grand Canyon, especially equipped bathrooms in museums and even ramps to the elephant house at the Oklahoma City Zoo. Cruises were put on hold until I could no longer travel on my own. But a broken tibia changed all that. Suddenly, ramps were important. Our trip to Mexico over Thanksgiving had been planned long before the accident. I intended to still go - it was just going to be different. Quick research confirmed another statue, The Air Carrier Access Act, prohibits airlines from discriminating based on disability. Consequently, a call to Aeromexico permitted a free change in seat assignments to the front bulkhead row, allowing more space for my partly bent leg as well as my husband’s long legs. Also ordered was a wheelchair for all airports, especially the vast Mexico City terminal. By departure time, I could bear some weight with a walker and opted to advance (slowly) on my own to our flight’s gate at DFW. At security, I had to pass the walker around a metal detector, take the hand of a security agent and hop to the other side where another agent passed her wand around me. The walker also got the once over to be sure no explosives were hidden inside. At Mexico City’s Benito Juarez Airport, Ernesto greeted me with a wheelchair and off we went, moving quickly down hallways, up elevators, and through a special line at customs. It was quite wonderful not have to interpret signs or arrows. I noted several disabled employees in wheelchairs available to assist passengers with questions. Since 2012, an employer in Mexico with more than 50 workers has to make accommodations for a disabled worker, a law that benefited those we saw. Ernesto came in handy as he encouraged us to “be calm” when the flight to Ixtapa wouldn’t show on the flight board. He did ask if I could climb stairs which was a negative. Since Mexico City’s Airport does not have sufficient gates for all flights passing through, some planes board on the tarmac. This requires bus transportation to the plane and entry by stairs. Before boarding the bus, I was strapped into a straight chair, without arms but with seat belts that crossed my chest. Two men lifted me on and off the bus. All other passengers had to wait on the tarmac as they pulled my throne up step by step into the plane. To my slight embarrassment, I faced outward to the crowd below curiously watching my regal advance. We had been assured the resort was disabled friendly and all rooms were equipped for that use. Technically, this was a true statement. Ramps were available for walkers and wheelchairs, even if the paths were far from direct. Each shower/bathtub had a seating area at the end and metal bar for balance – not exactly the walk-in experience I was expecting. But it all worked. I could do my prescribed water walking in the resort pool as well as I could have at Paris Aquatics. 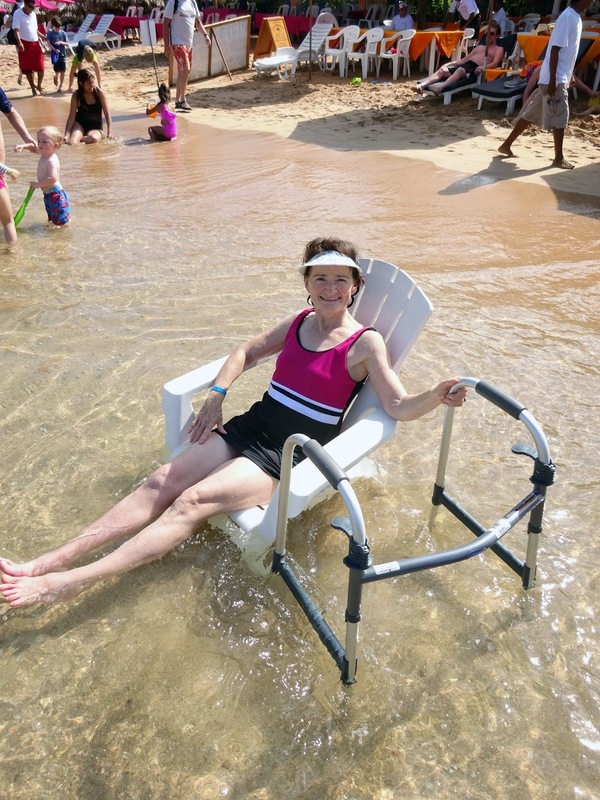 I also used the walker to enter the ocean and a family member retrieved it when I began floating. Exiting the water was harder as waves were in a bigger hurry to get to shore than I was. I wasn’t alone at the resort. Others using a wheelchair or cane would nod in mutual sympathy as we passed. My brothers accused me of getting special treatment from the waiters and I would agree. At the beach, one provided a small table by my chair for lunch and added an umbrella for my personal use. And many offered to carry my plate at the buffet. In healthy times, we would have taken advantage of kayaking, hiking, and biking. Instead, more time was spent with grandchildren in the pool and drinks served poolside - not a bad trade-off at all. Thanks to the laws protecting the disabled, the Mexico trip was doable. Different but doable. This translate as Homeland or Death but had a more popular meaning of "We Shall Overcome"
Today, official communism remains in only five of the 46 original countries - China, Vietnam, Laos, North Korea and Cuba. Communism still dominates Cuba but capitalism is gradually cracking open the door to greater economic and political freedom and Cubans are responding. Billboards preached Fidel Castro’s political teachings. “Patria o Muerte” translates as “Homeland or Death” but means “We shall Overcome”, a leftover phrase from the revolution in 1959. “Gracias Che’ Por Tu Ejemplo” or “Thank you Che’ (Gueverra) for your Example”. Or even a dig at the embargo placed by the United States to prevent most commercial activities between the two countries – “El Bloqueo- El Genocide Mas Grande “ – “The Blockade – The Biggest Genocide.” Most of the other vestiges of communism were more subtle and required conversations with Cubans. Much is provided to Cubans by the government but with a catch. All have free medical care but few prescription and non-prescription drugs are available. We were asked to bring anti-acids for an employee at the Episcopal cathedral since no pharmacy has these. All receive monthly food coupons but shelves are often empty. Powdered milk is reserved for babies and mothers, making café con leche a luxury for many Cubans. Yet, we didn’t see the grinding poverty that burdens so many Latin American countries. Several Cubans confirmed it doesn’t exist there but neither does the very wealthy class. Signs of capitalism creeping in were everywhere. 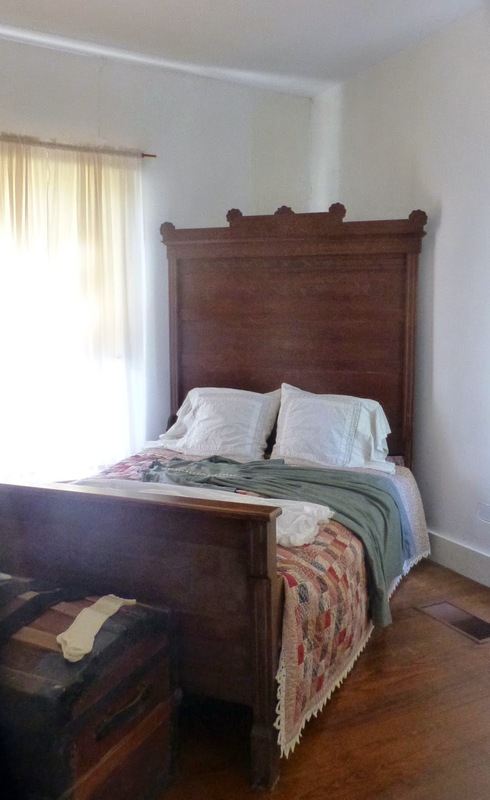 Fidel’s brother, President Raul Castro, has allowed individuals to open up their homes as a bed and breakfast (casa particular) or as a small restaurant (paladare). The latter were originally just Ma and Pa places with a limit of six tables allowed. Today, options have expanded and restaurants were varied and everywhere. 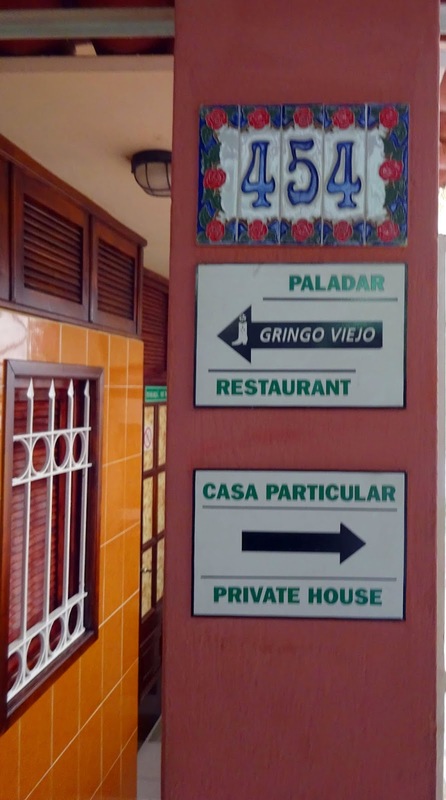 In Old Havana, we walked down an alleyway and into a very small paladar with daily specials. We watched through a window as the family freshly cooked each order on a four burner stove. In contrast, across the street from our hotel, a luxurious paladar filled a penthouse apartment. During a stormy evening, we dined on white table cloth enjoying a view of the Vedado section of Havana. Cubans are now allowed to work two jobs. The first may only pay $20 to $50 per month. The dream second job is in the tourist industry where tips greatly enhance a family’s standard of living. One of our tour guides was a photographer by day and a guide on his days off. A taxi driver supplemented his meager retirement income with fares. At our hotel, there were so many doormen, we could hardly keep track of their names. This allows full employment but most of them were also working elsewhere. After Russia pulled out its heavy subsidy of the Cuban government in 1995, Cuba had to reach out to foreign investments. Because of the embargo, the United States could not participate. But companies from 60 other countries invested in Cuba even though the Cuban government had to own 50% of the Joint Venture. Their headquarters fill the lovely Miramar section of Havana. Cuba also exports an interesting array of goods and services – minerals, natural medical drugs, cigars, rum, coffee, fish and professionals such as physicians. Eleven thousand Cuban physicians work in Brazil and send money home. Cubans are not dower as many people are in communist countries. They laugh easily and often tell jokes about their government but always in a conspiratorial whisper. Why did the Pope come to Cuba? Answer: To see the devil (code for Fidel Castro), to see hell on earth and to see how Cubans live on miracles. The government still has neighborhood watch groups whose job is to report on neighbors. After a driver told us the Pope joke, he looked hard at me and asked “You’re not a communist, are you?” And then we laughed together at the idea that I could report on him. A good question was asked by a European to a tour guide. “Are you better off with communism than you would have been under America’s influence?” I thought the guide had a diplomatic answer. She said, “It depends,” explaining that her grandmother had been a talented artist from a very poor family. They could not afford for her to go to college. Yet, under communism, her granddaughter got a free university degree and is now a tour guide, making her very proud and grateful. Our guide went on to say that if you had a business that was nationalized when Castro took over power, you would not think so highly of communism. In fact, you probably fled to America. Today, it’s not a question of whether Cuba will become more open and capitalistic but when. The government is trying to balance the benefits it has provided all these years with the need for more commercial activity. It’s an experiment worth watching. Let’s start with Havana. All have seen beautiful photos of the 1950’s cars, preserved when Fidel Castro’s revolution stopped time in 1959. 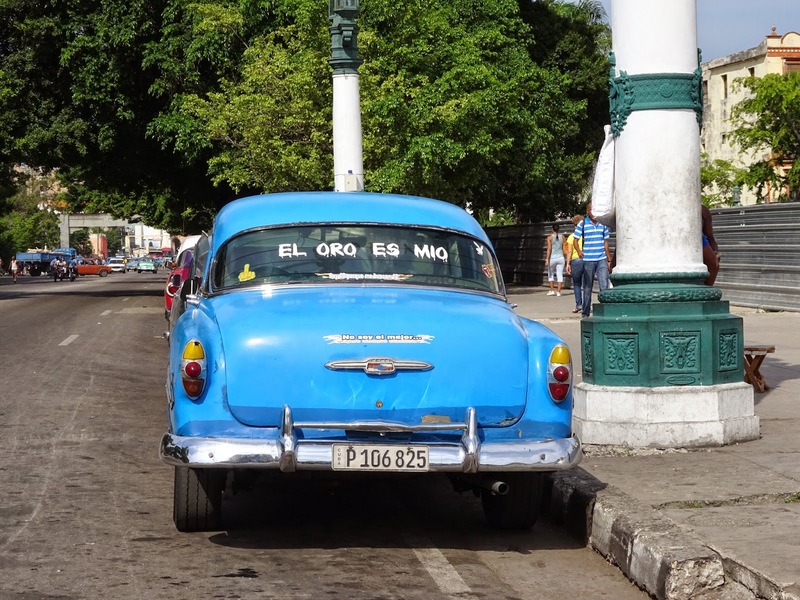 Havana’s close association with the United States meant almost all then existing cars were American brands. Because of the U.S. embargo, import of new cars came to a halt as did car parts. The latter was solved by ingenuity and determination. As one taxi driver told me, in Cuba, “todo tiene valor” or everything has value. Their cars were not repaired with genuine Chevrolet parts but somehow have continued to run. Not all cars have been maintained. There were far more classic cars than I expected. As I walked a block on a fairly busy street in a tourist area, I counted 25 passing by or about half of the cars. Called almendrones for their almond shape, many are used as taxis on a set route while nicer ones are individual taxis that cost a bit more than their Soviet taxi counterparts. The famous photos are of those in pristine shape but many look better outside than inside. 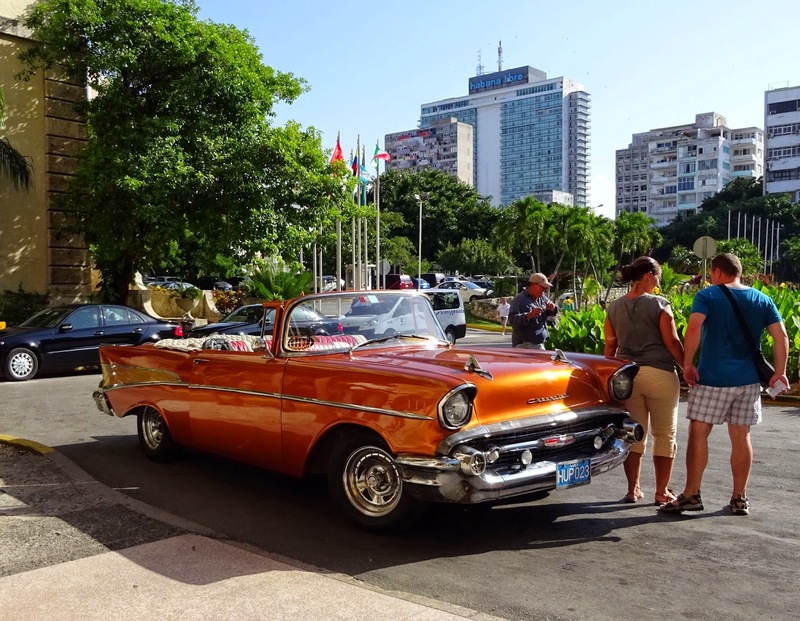 These 50’s cars have been declared a national treasure and can be sold only to fellow Cubans. American collectors may have a long wait to get their hands on these. 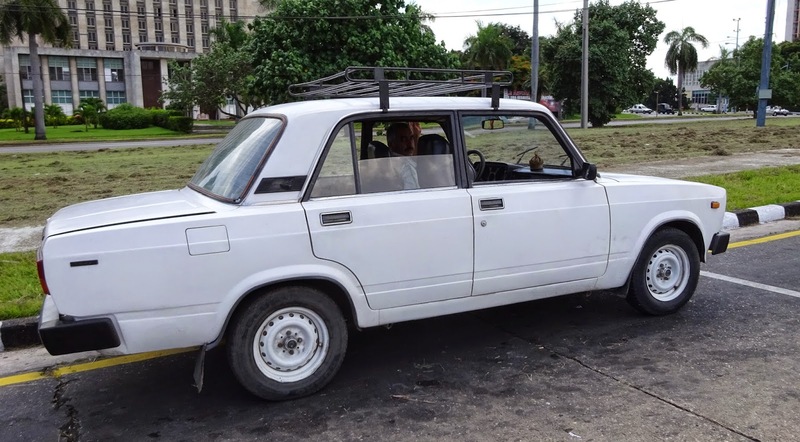 Soviet Lada used as a taxi. This one looked nicer on the outside than the inside. In the suburbs, the numbers of Eisenhower era cars diminish and dilapidated Soviet Ladas from the 70’s and 80’s appear. Originally used to reward workers, these make up much of the used car stock. Most looked rode hard and put up wet. It was only in the wealthier Miramar suburb, where the imposing Robocop shaped Russian Embassy stands with other embassies and ambassador’s homes, that I saw a BMW, a couple of Mercedes and newer Japanese cars. They are rare and notable. On the highway, an array of cars, trucks, buses and horse-drawn carts make their way down an impressive set of highways. To Cuba’s credit, the Central Highway of Cuba was originally built in the 1920s and extends 700 miles on four lanes linking the island east to west. Tributaries now run off the main road to smaller towns. Yet, the amount of traffic on these nice roads was minimal, an indication of how few Cubans own cars and how expensive gas is. On a bus ride west into the Vinales province, I would occasionally wait minutes before seeing another car. But ox drawn plows and old tractors with vertical exhaust pipes still dot the landscape, moving at the speed of yesteryear. 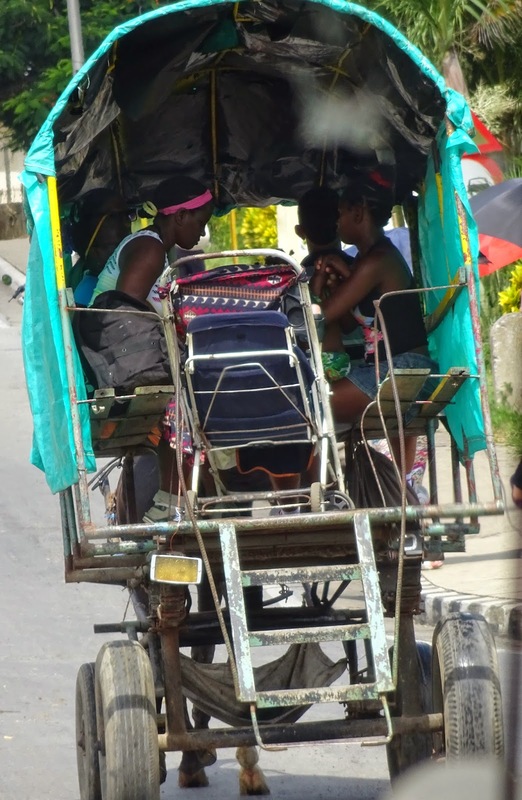 What was numerous on the roads were Cubans hitching a ride, lined up wherever the road widened. It wasn’t important if a bus came first or an almondrone on a set route or an individual lending a hand, or even the classic horse drawn cart. The latter was often a covered cart with benches down the side and an open back. One woman lifted her baby stroller into the cart before she hopped in. These are still in widespread use by passengers and farmers. Taxis were plentiful and we found their drivers a law abiding bunch. All stopped (or at least slowed significantly) at railroad crossings. Most seemed to stay close to the posted 60 mph speed limit on the highways. All waited for traffic lights to change. There was no passing on the hills that I’ve experienced in other Hispanic countries. They were also chatty and wanted to share their experiences in Miami or tell of their family there. We got to know Raul, a retiree who drives a taxi for extra money. His “taxi” carries no sign so negotiations were required for each trip. Raul’s monthly retirement check is $10. He still gets a food allowance and free health care but it’s hard to make ends meet. He sported a 1957 Peugeot with torn seats, rear view mirror that fell regularly, and shoulder belts drawn over the shoulder only when passing a policeman or a security check on the highway. The car also stalled at most stops. But we managed to twice get to San Pedro de la Norte, 30 miles east of Havana, and back. We took on a hitchhiker at one point to help find an out of the way village with a small Episcopal church. But we never felt in danger on any of our taxi rides and enjoyed visiting about their other job, their families, and even politics. When the U.S. Embargo is lifted, Cuba’s snapshot in time will gradually fade. More tourists will arrive. Money will flow. New cars will be imported. Cubans will be able to purchase them. What I do hope remains is the lesson learned from Cuba’s years of scarcity, a lesson our throw-away society could use – todo tiene valor. As travelers, Americans have traditionally been well treated by other countries. Most allow us to enter with a tourist visa obtained at the entry point – whether by land, air or sea. Occasionally, a visa must be requested prior to arriving by sending passports to embassies for processing. Because of where we entered, Cambodia, Argentina and Jordan demanded this procedure. It is much harder for most of the world to travel to the United States, requiring months of petitioning and providing verified information. Cuba is different. Getting in is not a problem. It’s returning to the United States that’s tricky. On January 1, 1959, Fulgencio Bautista, the U.S. friendly dictator of Cuba, fled to Spain. Fidel Castro’s army entered Havana and began the rule of Cuba that continues today. Castro didn’t start as a communist but moved that way quickly when Russia offered financial support. In response, the United States declared an embargo against the island. No American companies could do business there with some small exceptions such as agriculture. And Americans could no longer travel to the emerald island. Actually, the rule allowed Americans to be in Cuba but they couldn’t spend any money – an impossibility that ensured termination of tourism. Over the years, rules have softened. President Obama’s changes now allow those of Cuban descent to visit whenever they want. Cuba has also released its citizens to travel wherever they want as long as the country accepts them. Consequently, almost every person we met in Cuba had family in the United States and most had been to visit. 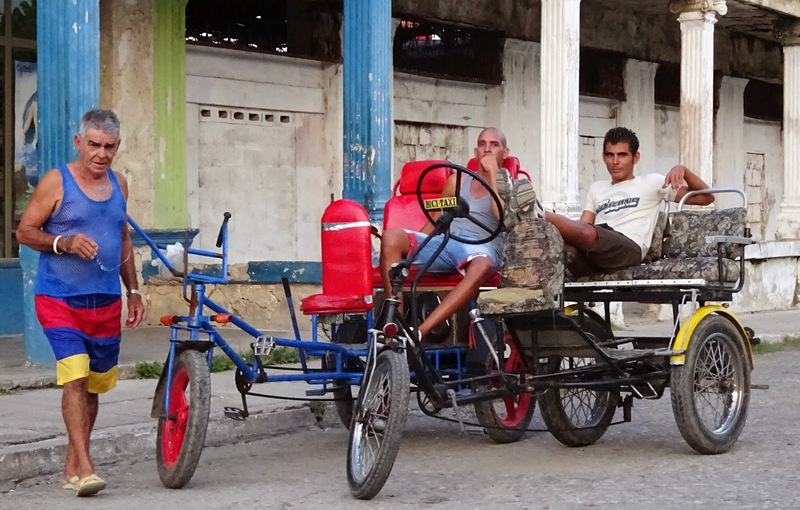 For the rest of us, there are two methods of visiting Cuba – one legal and one not. Wouldn’t you know the illegal way is easier. Simply fly to another country such as Mexico, Guatemala, or Canada, buy your Cuban tourist visa at the airport and fly from there to Havana. Ask the customs officer not to stamp your passport. Have fun in Cuba. Return to Mexico, Guatemala or Canada. Reenter the United States and simply fail to disclose that you took a detour to Cuba. Thousands of Americans do this every year. Truthfully, the risk is low. I could find only one notable case of an American being caught in the lie and having to pay a fine. Uneasy with that approach? Worried about your passport? Then let’s look at the legal way which has been expanded significantly by the Obama administration. Before, a license had to be obtained through Washington, a lengthy process. Now, you must be able to prove upon reentry that you’ve qualified for one of the new methods. These include visiting Cuba on a cultural tour. People to People is doing a brisk business in this category as is National Geographic, Road Scholar and university alumni groups. If you are conducting a study, you can come back in. And if your church confirms you as the church’s representative in Cuba, you’re good. 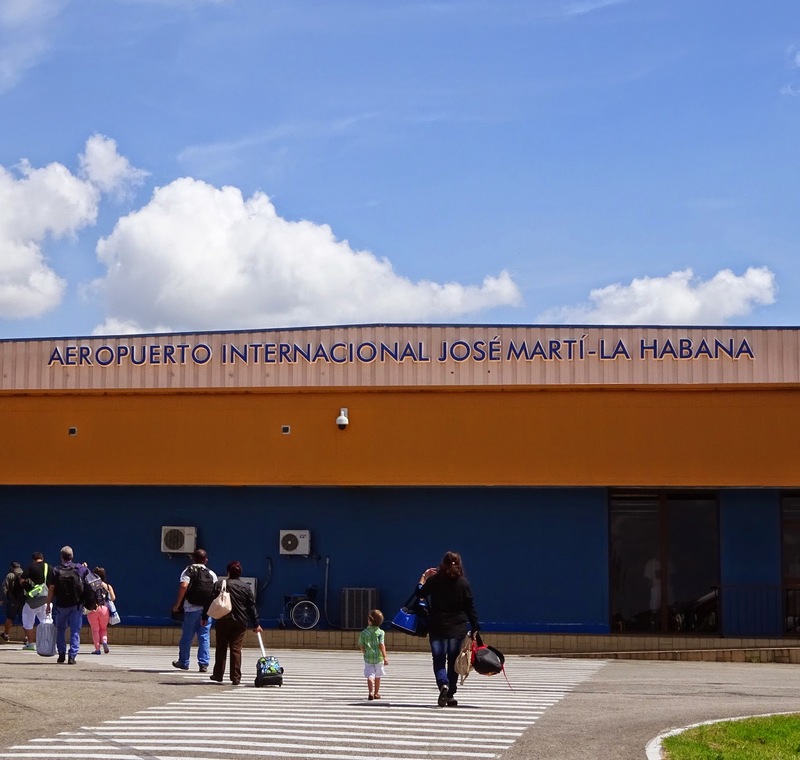 We worked with our local Holy Cross Episcopal Church to meet that requirement and with the Episcopal Church in Cuba to obtain the Cuban religious visa. U.S. airlines cannot run regular flights to Cuba but charter flights are allowed out of several cities, including Miami. These companies must be sure their passengers have the visa to enter Cuba and of equal importance, meet our requirements to reenter. They also provide the health insurance required by Cuba. We used ABC Charter which is actually owned by American Airlines. The plane had the bright new AA logo on its tail and its crew appeared to be seasoned. Judging by their accents, most passengers on the Havana flight were Cuban, either returning home or visiting relatives. Our seatmate was doing just that. Upon return to Miami, two People to People tours filled much of the plane. Leaving Havana at about the same time was a Jet Blue charter flight. I think both American and Jet Blue are poised for the lifting of the embargo, although there’s no sign of change yet. The details of our trip took eight months to confirm. Charter flights can’t be booked until two or three months out. Email to the Episcopal Church in Havana was not always reliable. Delays in getting a Cuban visa were notable. Ours arrived 10 days before scheduled departure. But it did finally come together and we touched down on a beautiful September morning. Customs was smooth and we saw Cuba for the first time. With a son living in Olympia, Washington, I’ve become familiar with the Queen of Washington’s Cascade Mountains – Mount Rainier. Its Native American name of Mount Tacoma was shelved in 1792 when explorer George Vancouver named the mountain after his friend, Pete Rainier, a Rear-Admiral in the British Royal Navy. 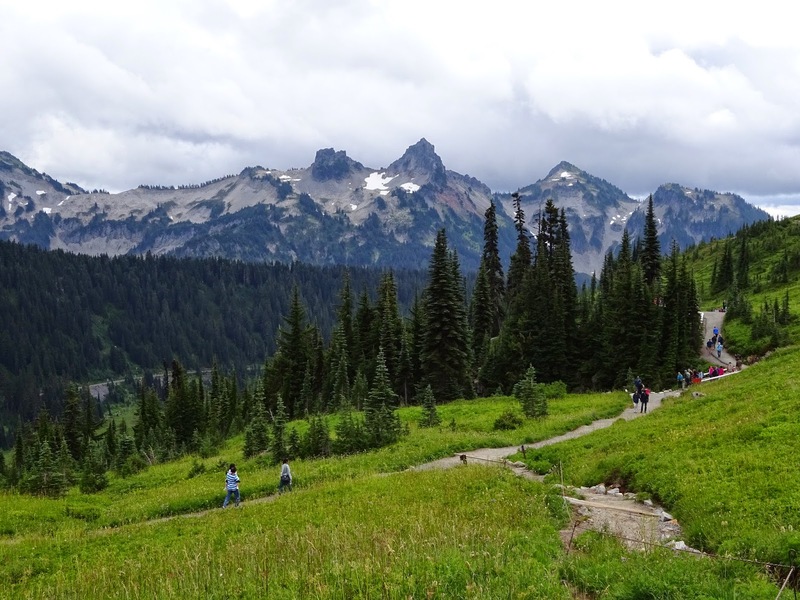 Probably few of the two million visitors a year to the Mount Rainier National Park realize they’re climbing on a mountain dedicated to an officer who heartily fought against the United States in the Revolutionary War. Despite its British ties, Mount Rainier is beloved in her home state. When the snow covered peaks appear in late afternoon, many citizens of Seattle, Tacoma and Olympia pause to look her way in acknowledgment of her majesty. When our family set out to visit Mt. Rainier National Park, she was covered in clouds. But since the huge volcano creates its own constantly changing weather patterns, we knew there was always the possibility of seeing the grande dame. What makes Mt. Rainier unique is her 25 glaciers with 36 miles of packed ice - largest remnant of the Ice Age on one mountain in the world. At 14,411 feet, it’s only the fifth highest peak in the United States but sports more snow than any of the others. In fact, it’s one of the snowiest places in the world, getting an average annual snowfall of 56 feet. As we ate a late Sunday brunch in the dining room of 100 year old Paradise Inn, the view was of wildflowers, green meadows, and occasional 1,000 year old trees, reminiscent of Switzerland in the summer. In the winter though, the same large windows would be blocked by deep snow. On a trail, a park ranger pointed out the volcano’s own 18 foot tall weather station that snow would cover in a few months. Trails began near the Scoop Jackson Visitors Center, a huge gathering place for the many travelers that day. The crowd reflected America’s welcoming arms, both for immigrants and visitors with a heavy emphasis on Asians. I thought it a busy day but two employees shrugged and said it was average. A surprising number of trails were paved – steep but paved. These paths brought out the families with baby strollers and wheel chairs. All wanted pictures taken in front of the waterfall, near the wildflowers, or with the big mountain in the background. Strangers exchanged cameras to take the other’s family photo. Still, the mountain top had not appeared beneath the clouds. Mt Rainier is a popular climbing site with about 1,000 annual attempts at the summit but only half successful. Occasional deaths are inevitable. Just in May, six experienced climbers died on the ascent. Most hike to a cabin built for them, sleep a few hours, and leave about 3 a.m. to make the top before snow begins to melt. I wondered how many were up there that very day. A second trail through well tended forest ended with a view of the leavings of Nisqually Glacier. Bare grey rocks disguised the stream running through. 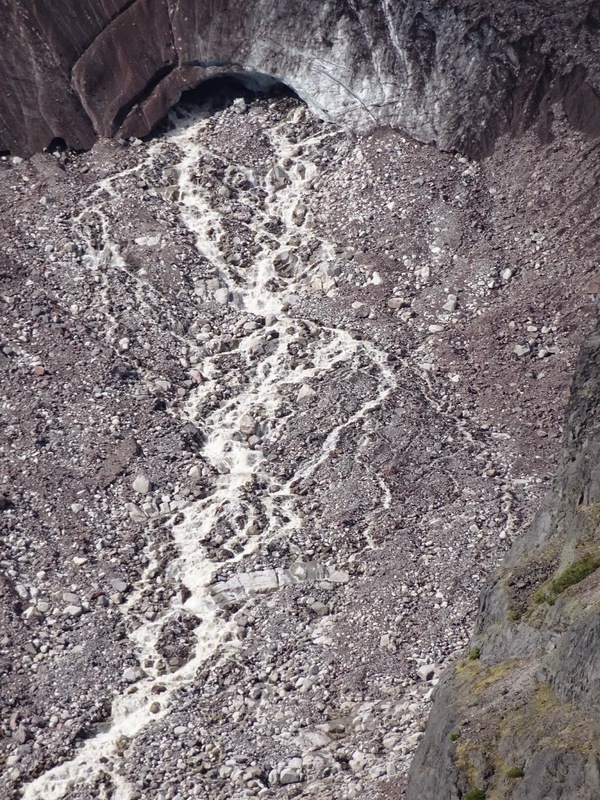 Much of the water appeared to be emerging from a large cave, one of many formed by the geothermal heat from the volcano. Clouds were lifting but the mountain only teased us with an occasional shrouded peak at the summit. The day was waning as we began our descent down the mountain’s side, glancing back often. It was then that Mt. Rainier threw off enough of her wrap to reveal one of her famous three peaks. We pulled off on a widened part of the road and were quickly followed by several cars. They had seen it, too. Picture taking began anew. There are warnings about visiting Mt. Rainier National Park. It is an active volcano – the second most active in the Cascade Mountains after Mount St. Helens. Thirty earthquakes a year occur beneath its beautiful veneer. The last eruption was as recent as the end of the 19th century. It is one of sixteen on the “Decade Volcano” list that identifies those of most concern in the world. An eruption or even a steam flow from Mt. Rainier would cause much destruction in the surrounding heavily populated areas. But still we go, by the millions, to get close to her, to feel her heartbeat, to experience her past. In John Muir’s words, we go to gaze in awe at that “noble beacon of fire”. From chariots in the Roman Coliseum to the Indianapolis 500, racing has provided entertainment through the ages. Faster is better. Fastest is best. I’ve seen horses, dogs, and camels rush to the finish line and sailboats and canoes hustle to be first. Even plastic toy ducks can dawdle on down to raise money for our local Boys and Girls Club. 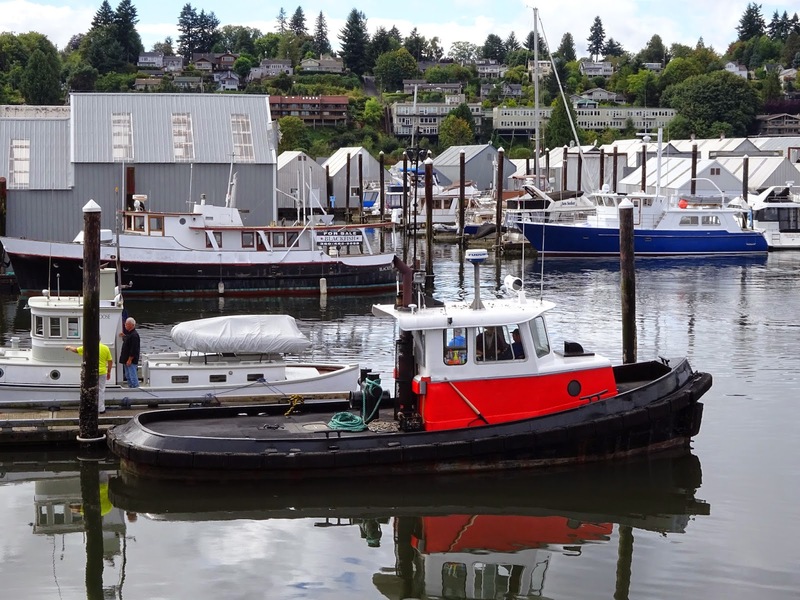 I just never considered tugboats as racing instruments – a seeming oxymoron- until visiting Olympia, Washington during its 41st Annual Harbor Day Festival. “Think about it,” 5th generation Olympian Ralph Blankenship explained. “Large sailboats needed small tugboats to bring them into port. And before easy communication, the first tugboat out would get the job. They had to be fast and powerful.” In this case, fast is relative. Blankenship agreed the idea of a tugboat race was a seeming contradiction in terms but has loved watching the laid back pursuits that often top out at 11 knots or 12.5 mph. 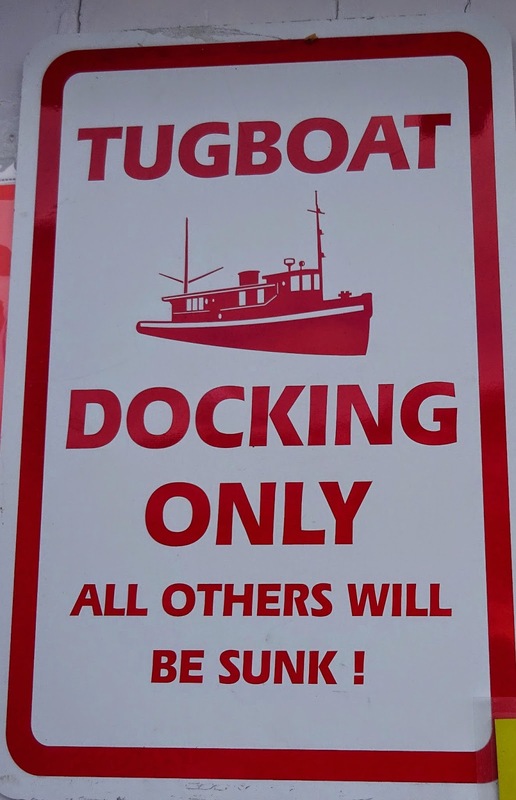 Fortunately, there are three motor size categories in the race to protect smaller tugs from larger ones. The racing tugboats gather at Olympia’s harbor, where Puget Sound ends under the shadow of Washington’s capitol building. During festival week-end, the public can explore the boats, most of which have been working for years or are retired. 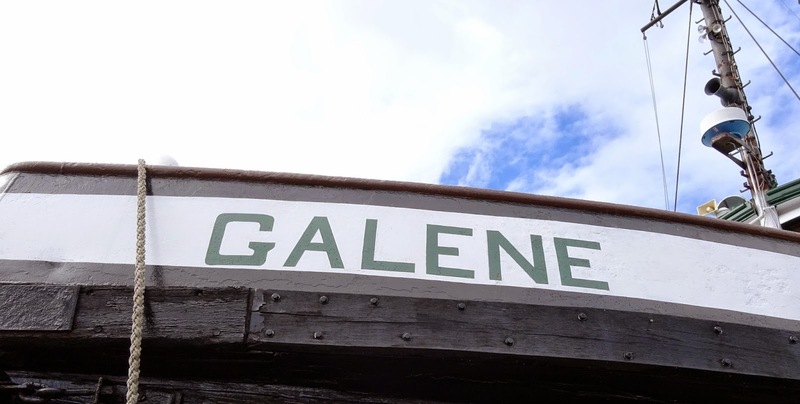 One of the oldest and the largest was the Galene, one of 61 boats built by the U.S. Army in 1943 to accompany battleships across the ocean. Only four remain operational. Owners Skip and Marty Suttmeir, found the Galene for sale on Craig’s list in 2007, restored it and now live comfortably on it for several months of the year on Seattle’s Lake Union. In the over 400 HP category, the Galene came in first, winning by a mere 45 seconds over second place Shannon , owned by Captain Cindy Stahl. The Shannon is a working tugboat, guiding pulp barges to Canada. Built in 1957 and refurbished in 1977, the boat changed ownership four years ago. Captain Stahl’s trips take approximately 19 hours to arrive in Canada, making the complete journey a three day adventure. As a consolation prize, the Shannon did receive the “Spiffy” award for being the neatest and classiest boat in the race. 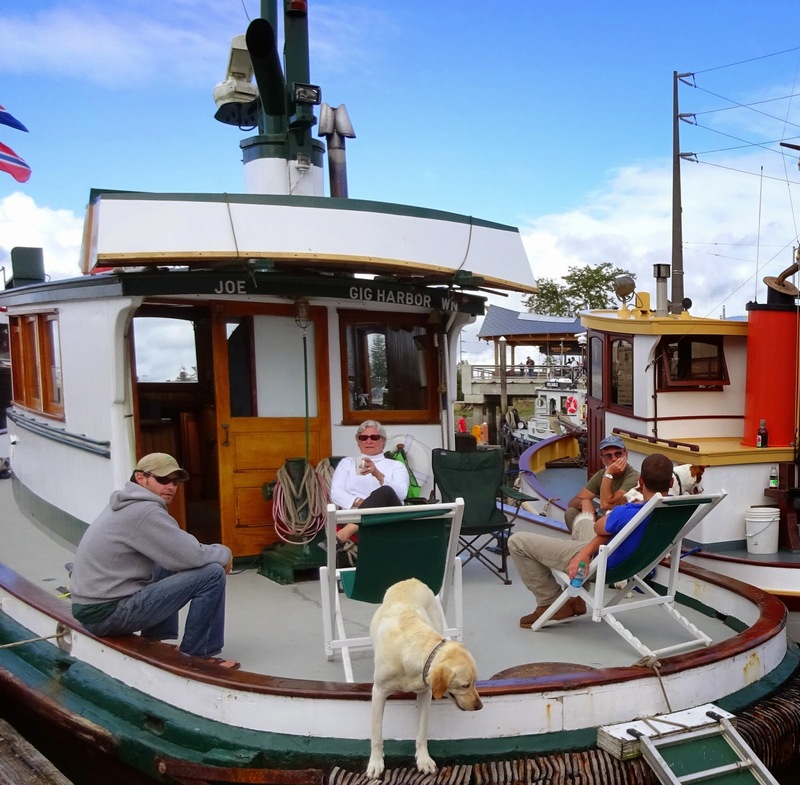 Owners of the tugs were available to chat with visitors while their family and friends relaxed at the stern or rear of the boats, creating a kind of “tailboat” party atmosphere. Large umbrellas shaded the gatherings with ice chests readily available. Old captain friends caught up with each other. One congratulated a younger captain on his appointment to oversee the Seattle Port tugboats. He would supervise steel tugs with the needed 2000 HP to guide modern cargo ships. Moored permanently at Olympia’s harbor is the Sandman, a 100+ year old tugboat that has been restored and can be explored anytime. Some of the original wood remains as does its massive steering wheel. With a 110 HP motor, the Sandman would have accompanied barges of sand and gravel, brought in to use in construction of many of Olympia’s buildings. And in case you got carried away with tugboat fever, the 1967 Mary Anne was for sale. Others could find a selection on Craig’s list. One owner strongly urged bargaining as he was able to pay $20,000 for a boat originally listed for $80,000. Since the debut of the first tugboat in 1802, progress in building has led to stronger, more powerful boats. As recently as 2008, the first hybrid tugboat was built. Only two or three tugs are now needed to maneuver even the largest of ships. They are a far cry from those used to great moral purpose in children’s books such as “Little Toot” or “Scruffy the Tugboat” who discovered there’s no place like home after exploring rivers and lakes. 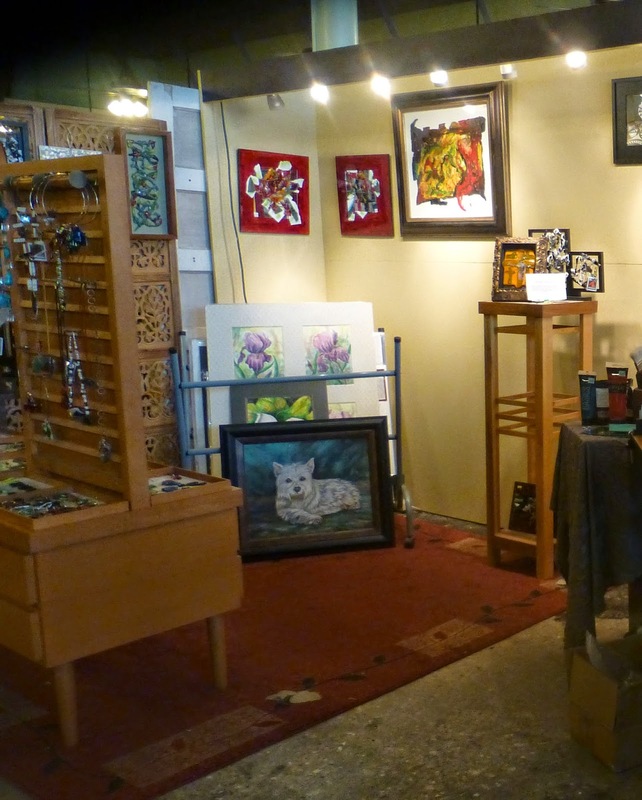 The Harbor Festival also included a large assortment of artist booths, many with nautical themes. Live music entertained all. And fresh salmon smoked over an open fire was available for purchase. We knew we were in the Northwest. Each town wants a unique and appropriate festival. Olympia found one with their tugboats – our unsung heroes of the waters that slowly and steadily cross the finish line. 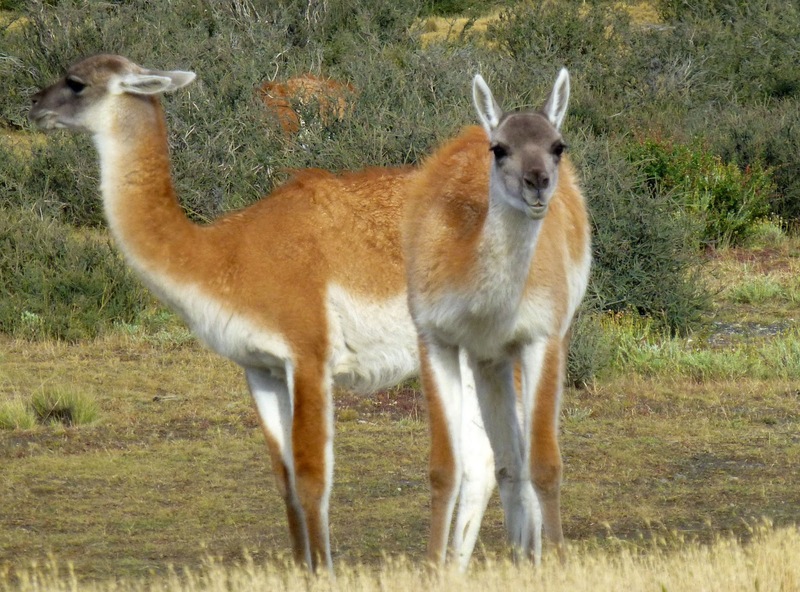 But Nature had much to offer Lady Dixie - herds of 5,000 guanacos (small members of the llama family), groups of 100 rheas or small ostriches, wild foxes, and pumas. And, as they approached the majestic Cordilleros mountain range, geese, duck, swans, and flamingos appeared near the lakes. Wildlife was not just for viewing as they were all hunted for food with help from the dogs. Califate berry bushes and wild cranberries provided some variety in the diet. And the ibis made a great broth. They passed an Argentine gaucho, native tribes traveling and traders with their wares. Never sure whether those approaching were friend or foe, Lady Dixie’s entourage kept guns handy. Finally, they entered the mountains from the barren plains. Despite the “almost painful silence”, Lady Florence knew her view of Torres del Paine (the Towers of Paine) with the snow covered mountains and glaciers was not yet shared by any other woman of her world. Penciled sketches brought back her majestic views to England to prove her discovery and to entice others to visit. One hundred and twenty-five years later, I followed much of Lady Dixie’s path but in significantly more comfort. Also starting in Punta Arenas, we traveled north by bus the first day, crossing the same Pampas, enduring equally strong wind, and awaiting the same snow covered mountains to gradually appear out of the haze. 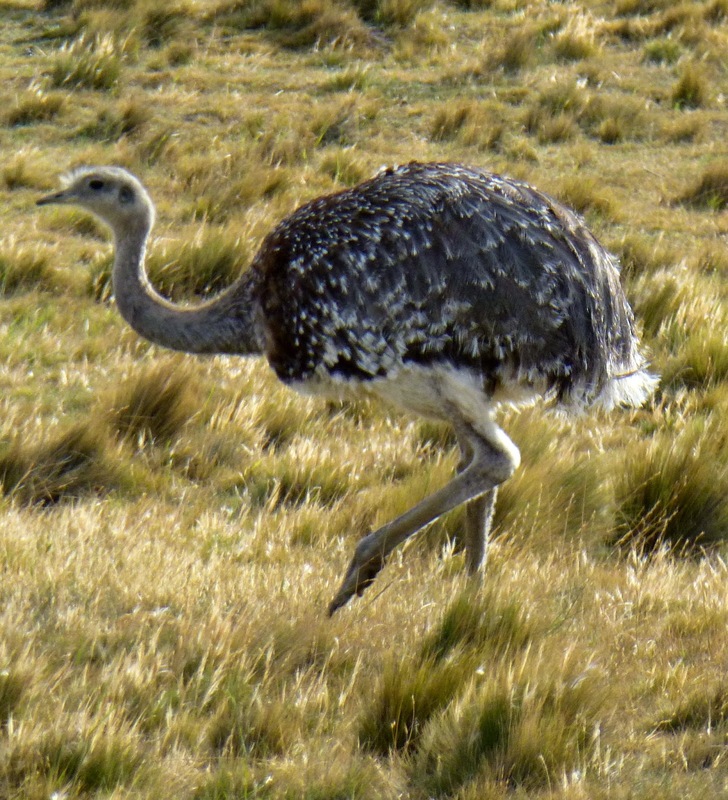 While the numbers of wild life were greatly reduced, we easily found guanacos and rheas as well as geese and ducks. Sheep and cows were now numerous mixed with wild horses. The modern world shone bright with an oil refinery and wind turbines. Plastic bags were caught in the brush like modern day tumbleweeds. We stopped three times to pick up passengers waiting on the side of the road and at a bus station on an air force base. And as we neared the mountains, beautiful estancias, tucked in ravines, provided green relief. In a van on the second day of traveling, even fewer cars were on the road. A sign warned “Watch for Flying Sand”, a rather obvious danger, I thought. While stopped to observe our first eagle, we heard nearby Cara Cara birds squawking loudly and for good reason. Three grey foxes were stealing their babies. More guanacos passed by, easily jumping the fences. And rheas seemed more numerous, possibly thanks to their being protected by law. 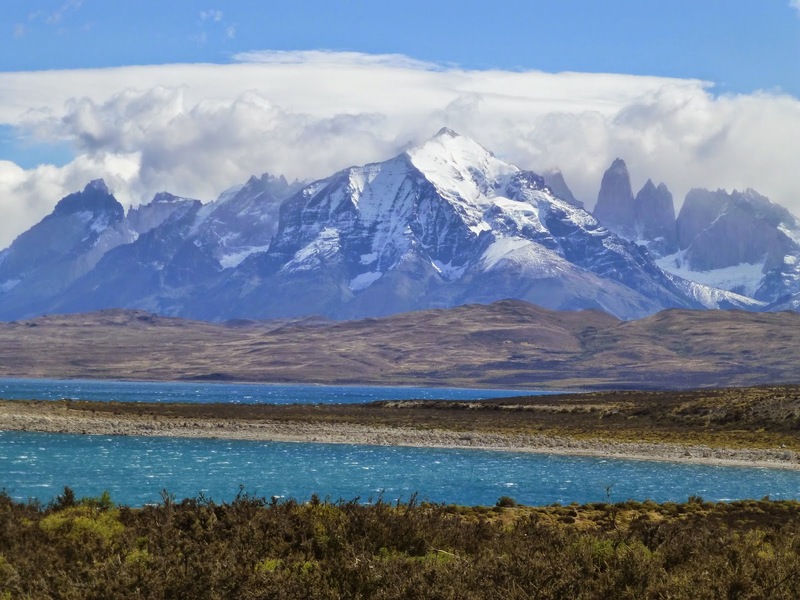 In a mere 1 ½ days, we arrived at the foot of the mountain leading to the three towers of Torres del Paine, Lady Dixie’s ultimate site and one she described as “Cleopatra’s Needles”. Our trails were more worn, filled now with visitors from around the world and we slept in beds rather than tents. But we did share the building or contribution to rock cairns found along the trails while Lady Dixie alone carved her name in a yet unfound tree. Lady Dixie is well known in the Patagonia area today. 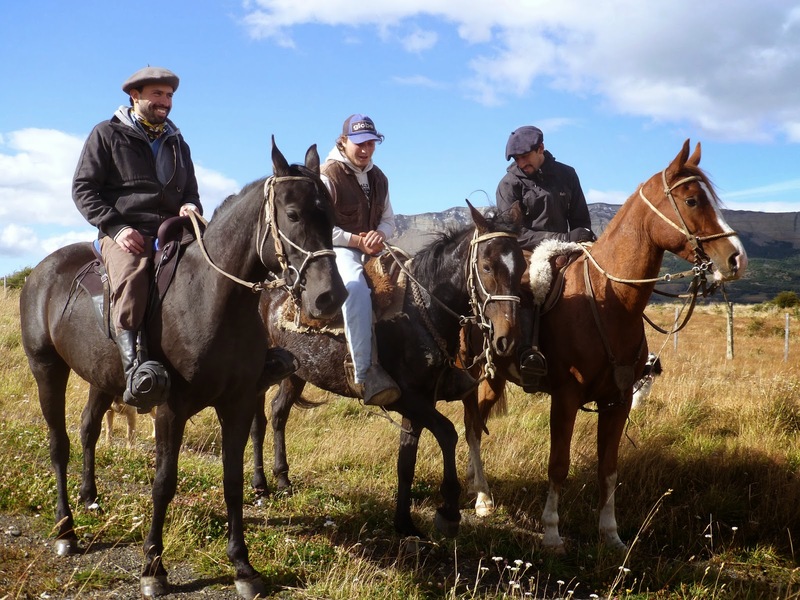 A hotel in Puerta Natales is named in her honor and guides nod in recognition when you mention her name. It was a relief to find the landscape intact and the wildlife visible – just as she wrote. What hadn’t changed in those years was the vastness of the mountains, abundance of glaciers and waterfalls, stratified soil colors, scattered rain clouds, streams of clear water, and blue glacier lakes – all a geologist’s dream and a traveler’s thrill. Lady Dixie dedicated her amazing journal to His Royal Highness, Albert Edward, the Prince of Wales. I think I’ll dedicate this column to Lady Florence herself – another adventuresome spirit of a different era. Denison, Texas began as a company town built by the Missouri, Kansas and Texas Railroad (called the KATY), the first railroad into Texas. At its height, half of Denison worked for the KATY, including David Eisenhower from 1889-1892. 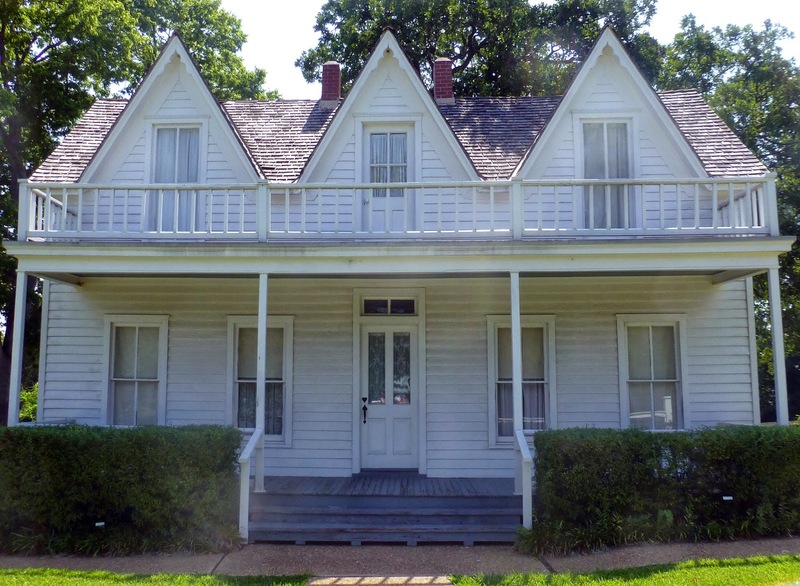 In a small white clapboard house across the road from a railroad tract, the family’s third son, Dwight D. Eisenhower, was born in 1890. 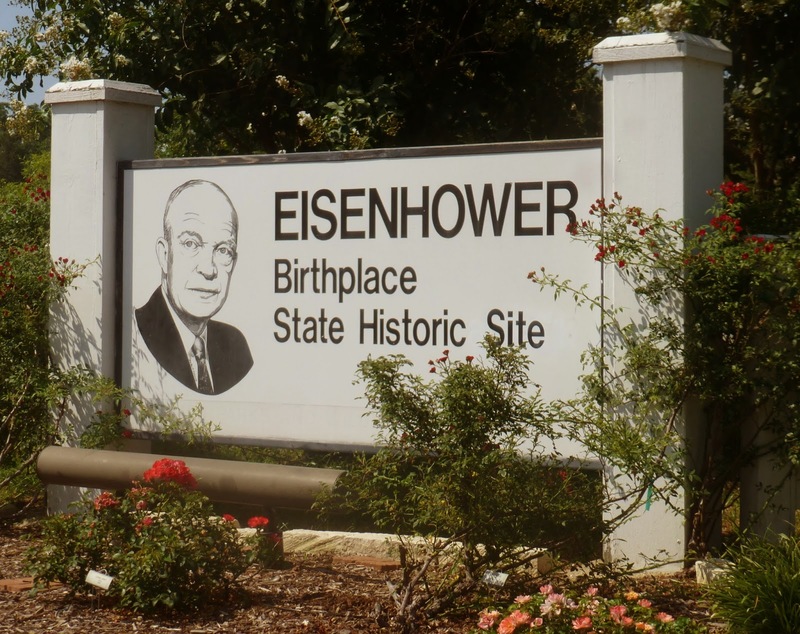 President Eisenhower’s birth details may have been lost since all births were at home and Denison had no hospital. As late as his application to West Point, Dwight thought he was born in Tyler. However, Principal Jennie Jackson remembered the Eisenhower family and contacted him when he became famous. Denison’s downtown is surprisingly long and large with the train station anchoring the east side. This is the third station on the site and includes a wedding venue in the former waiting room and a railroad museum. 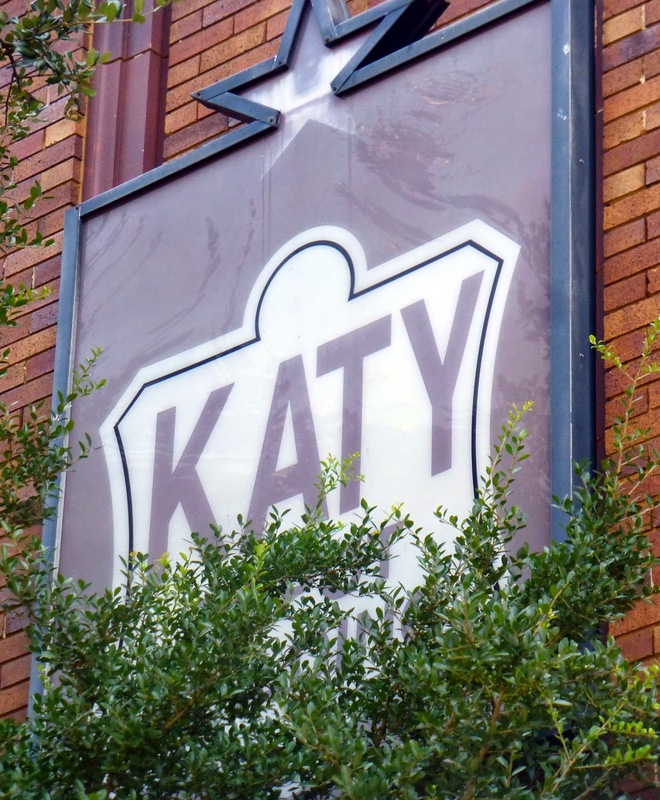 There we learned Union Pacific bought the KATY railroad and still runs freight trains through the town. However, the railroad yard now lies west of town and is a busy place. 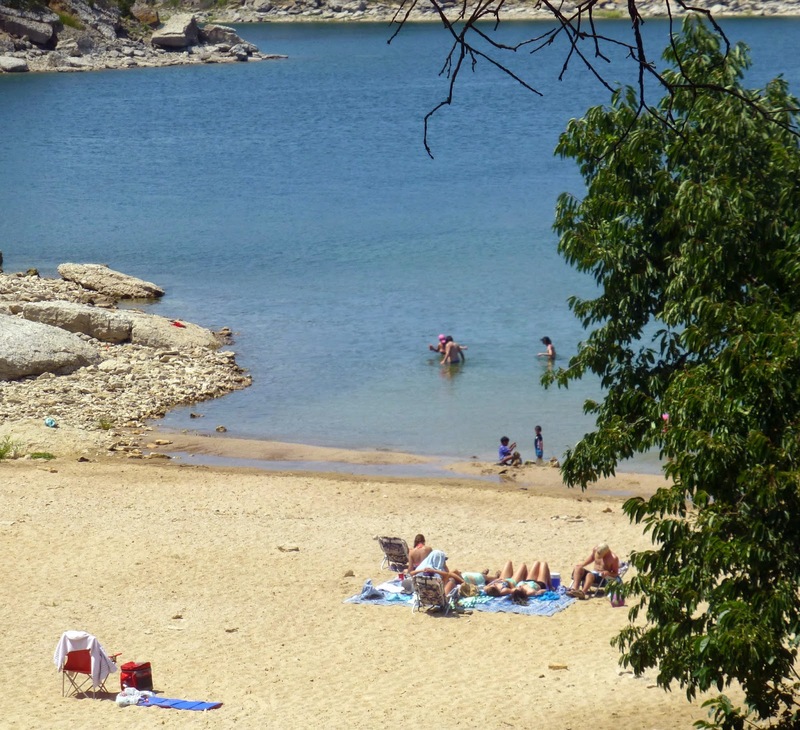 Continuing to capitalize on the brief Eisenhower connection, the city boasts of nearby Eisenhower State Park on Lake Texoma. This is a large park with many camping spots, screened in cabins and some serious marinas, including the Eisenhower Yacht Club. An employee acknowledged there is no club nor club house and the name is just a fancy way to describe the marina. Pontoon boats are available for hire and we particularly liked the small swimming beach. We were sorry not to have brought swim suits to enjoy the clear, cool waters. Further around the lake we found the Compass Rose – an exact replica of a wooden, tall sailing, brigantine privateer boat from the 1860s. It was undergoing repairs as we approached. A young man introduced himself as Mark Nagel. “I’m the quartermaster,” he said. Captain Ron Odom soon approached and shared the history of his boat. She was built in 1968, has traveled around the world twice and is one of only 145 remaining privateers in the world, few of which are still sailing. Since their purchase, Captain Ron and his wife, Tamie, have refigured the sails into a square rig which allows the boat to turn in any direction, picking up the wind on the lake. They’ve replaced just about everything, furnished it with period pieces and covered the hull with fiber glass to protect it from growth in the lake. This nautical life is especially surprising for Ron who lived 52 years on a cattle ranch in West Texas. After spending summers sailing in the Caribbean and owning a series of Hunter boats, Ron and Tamie are finally living their dream. 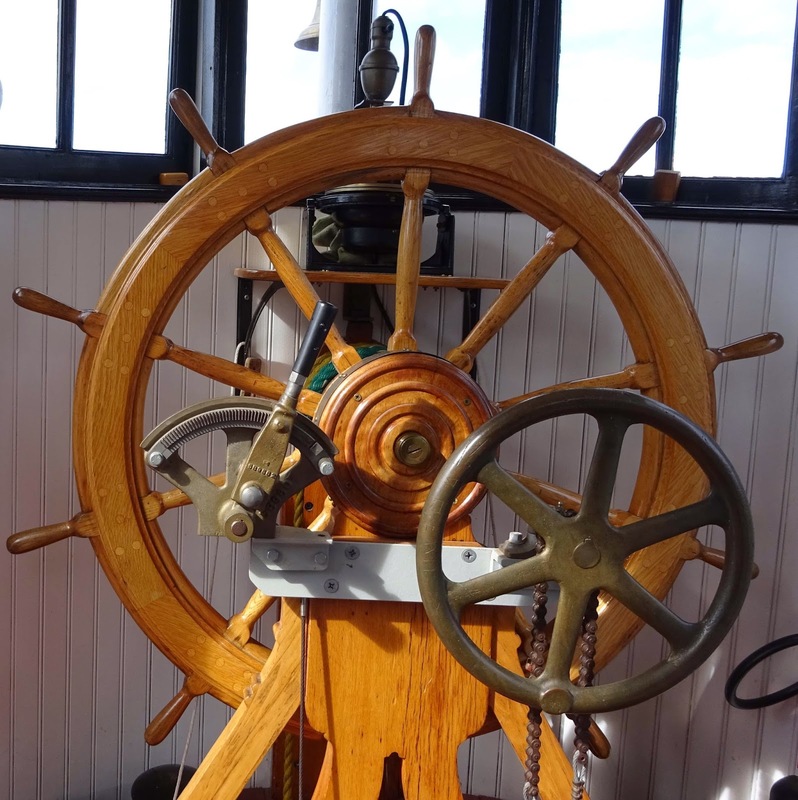 The Odoms have made the ship available for tours (1st and 3rd Saturdays) and sails. All of the crew work as volunteers except a required 100 ton captain. Passengers are treated to pirates in authentic costumes, complete with an ex-marine who climbs the mast and rigging. 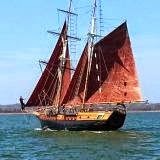 Check their website for sailing times, including their full moon events. Denison has an eclectic assortment of history, art, recreation, and entertainment for visitors – certainly enough to fill a day or weekend. Since it’s just an hour down the road, more in Paris should take advantage – unless pirates make you nervous. The travel day had already been long - early morning wake-up call, two hour drive to the airport, parking, check-in, security review, first flight out, lost in a new airport, and now, finally, the second and last flight from Mexico City to Oaxaca. American Airlines brought us to Mexico City and bankrupt Mexicana was to carry us to our destination. I walked into its clean, new airplane and immediately relaxed as classical music played overhead and wondered why other airlines didn=t use Mozart to calm passengers. But then all international airlines have their own personalities. Fly any of the Asian Airlines and the attendants will take you back in time when Astewardesses@ had to be of a certain height, weight, age, and appearance. At Los Angeles Airport, I watched a crew of Singapore Airline attendants pass - bright smiles, hair drawn up, hats precisely tilted, and dressed in tight skirts, draped scarves, belted waists, and high heels. All heads turned to watch this perfectly coiffed cast pass effortlessly through security. I wanted to be on their flight. On a Cathay Pacific flight to Hong Kong, lovely attendants treated our general class cabin as if we were in first class. The array of food choices was staggering – American, Asian, Indian, vegetarian, egg free, dairy free, kosher. Soft voices whispered in my ear to determine if I were awake enough to want a snack or breakfast. Warm damp towels freshened my face. And bathrooms were kept spotless throughout the long flight. My experience with Egypt Airlines from New York to Cairo was in sharp contrast to the Asian ones. Only male attendants dressed in blue and gold suits served us, and men being men, the bathrooms needed far more attention from the staff than they got. No alcohol was allowed because of its prohibition in Islam. That didn=t stop the loud visiting among passengers. Egyptians are, in general, a happy bunch and even some of the attendants joined in the bantering that crossed rows and aisles. I sat next to a couple who, judging by their tete-a-tete murmurings, were newly married. They weren’t and acknowledged just enjoying time together before meeting their large family in Cairo. The husband wanted to know where my husband was. Alitalia Airlines has been in and out of bankruptcy for years, with a lousy on time record. On a trip to Italy and Tunisia though, it had the best schedule and prices. The airline makes up for their often late arrivals with an open bar at the back of the plane – literally open bottles of wine that passengers pour themselves. That made the rear of our plane the place to solve world problems which several travelers tried to do all night. Turkish Airlines was all business but its low cost competitor, Pegasus, reminded me of the early days of Southwest Airlines, when flight attendants often joked around and gently teased travelers. Pegasus’ obligatory safety film was made with children giving instructions – so amusing that everyone actually watched. I had long been intrigued by El Al, Israel’s closely guarded airline, and finally got to try their services en route to Tel Aviv. At Newark Airport, each passenger was separately interrogated. My questions included where I was staying, who I was visiting, name of my landlady, had I ever been to the Middle East, why are you going to Israel, to Jordan? On board, Hebrew dominated and passengers included bearded rabbis, large Hasidem families, a teenage girl in braces who bobbed her head in prayer through the night, and a handsome, teasing flight attendant. Humus was standard as was the wonderful Middle Eastern breakfast salad with seeds and nuts. In using international airlines, it’s been a surprise to be served meals and local products, even on short flights. On an hour and a half flight from Hong Kong to Hanoi, we were given a hot lunch on Vietnam Airlines. An even shorter flight from Santiago to Puerto Montt, Chile was enough to be offered cold cuts on Sky Airways, a start-up Chilean airline. On a 50 minute puddle jumper with Tunisair from Tunis, Tunisia, to Palermo, Italy, a sole attendant was able to distribute sweet snacks and hard candy. With its mostly male attendants, Quantas Airlines made available Australian wine and beer as well as Australian movies such as “There’s nothing I’d rather be than an Aborigine.” Swiss Air served the best milk chocolate candy ever and Dutch KLM promoted its dairy products, including Gouda and Edom cheese. In these days of tedious air travel, concentrating on the novelties of an airline helps pass the time. The differences are there, just waiting to be noticed. And for those who prefer a taste of home, Coca Cola is always available – always. Since 1946, film festivals have been held all over the world - from Cannes to Venice to Toronto to Sundance with emphasis on first time releases, ethnic origins, genres, independent film producers or even documentaries or shorts. I’ve seen promotions of festivals from Antalya, Turkey to Ft. Worth, Texas as communities work to attract visitors. But my cousin takes his Mountain Film Festival on the road to where viewers are most likely to be. Patrick Moore grew up in Lubbock, graduated with a fine arts degree from Texas Tech, and became a serious world traveler thanks to a job maintaining satellite dishes at U.S. Embassies around the globe. Even with extra pages, his passport never lasted long and was replaced often. Wherever he went, Patrick hiked and explored and kept up with climbing feats around the world. On a whim in New Zealand several years ago, he called Sir Edmund Hillary of Mt. Everest fame. Sir Hillary invited him to his home and Patrick spent the afternoon with the family, learning more about the famous climber’s life. Patrick married a beautiful Chilean American Airline attendant and settled in Santiago to raise his family. He found the outdoor opportunities in South America unparalleled and he and his family often hiked, biked, climbed and camped. In his backyard is a climbing wall and a shed full of outdoor equipment. Even before the embassy job played out, Patrick explored bringing a film festival to the far south that played to his interests - mountain climbing and extreme sports. He found two. The Banff Film festival licenses 25 films to be available to hosts like Patrick who select those they wish to show at their own locations. 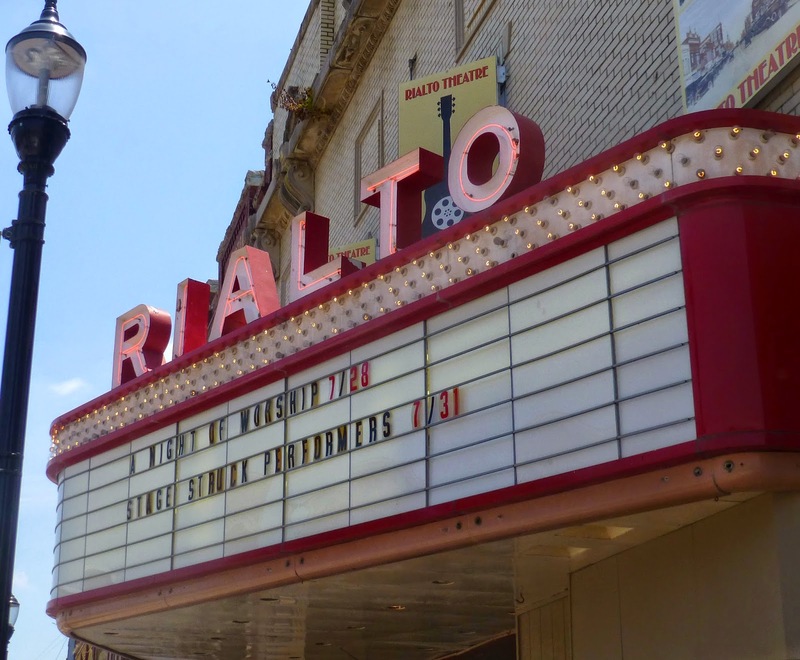 He also picks up the four climbing films offered each year by The Reel Rock Film Tour. This year featured a harrowing rock climb by individuals who had missing limbs but no lack of courage as well as the Stonemasters, a 1960s group of self-taught rock climbers who ruled El Capitan in Yosemite National Park. What distinguishes Patrick’s two to three day festivals are his speakers and workshops on mountain climbing that accompany the films. The Mountain Film Festival is shown in 13 South American locations in Chile, Argentina, Brazil and Peru - just about anywhere young climbing enthusiasts congregate. Backpackers love it when the festival arrives in town or even on the slope. Entertainment is hard to come by in most outback areas. His most challenging location is at Aconcagua, highest mountain in North and South America at 22,000 feet. In February of this year, Patrick carried his High Definition projector while others packed in a 22 foot inflatable screen. It took two days of hiking to arrive at the second base camp of the mountain. 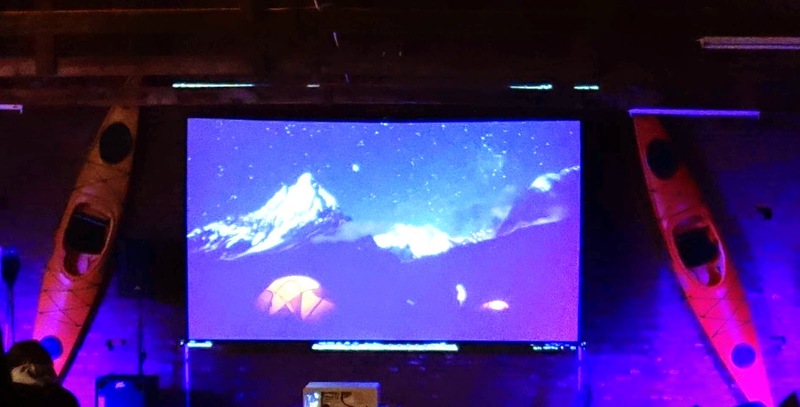 There at 14,000 feet, the movies were shown on the screen under the stars to 200 grateful and amazed campers. After years of following Facebook posts on Patrick’s festivals, I had the opportunity to experience a showing in Puerta Natales, Chile, a town of 20,000 where many launch into Patagonia. While North Face is his primary sponsor, Patrick finds local companies to help with overhead costs and to promote the showings. In Puerta Natales, Erratic Rock, a local hostel/outfitting company, provided assistance with the location and set-up. Posters of the festival had been hung around town and the local newspaper covered the upcoming event. We arrived on a rainy night at a large, metal hanger for a showing of “Towers of Temptation”, a film on the first ascent of the central towers of Torres del Paine in Patagonia 51 years ago. At the premier showing in Santiago, Patrick had even brought in the film’s director, Leo Dickerson, to speak. Inside, indirect lighting illuminated walls of powerful photographs of climbers and the towers. 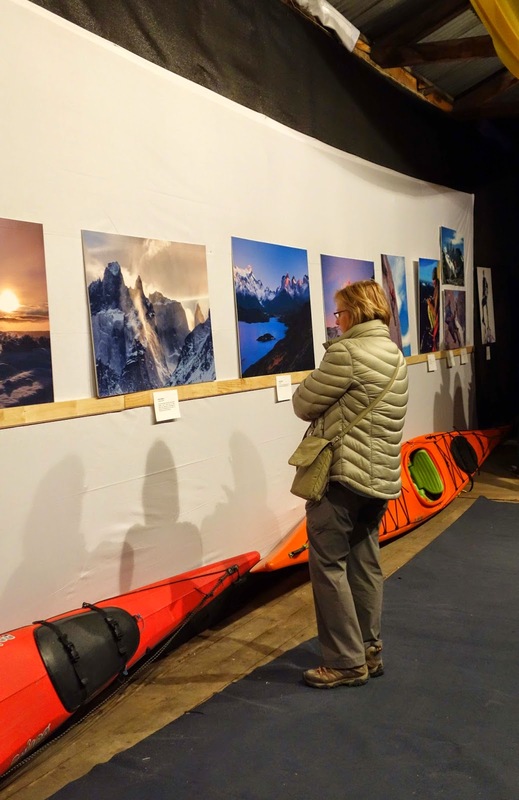 Outdoor equipment such as kayaks, mountain bicycles, and tents were displayed. Young travelers from around the world milled about - visiting, comparing, sharing stories. Some even carried their backpacks as if they had just arrived in town. Hot cider was served. By the time of the showing of the first film, the 200 chairs had filled and all settled in for an evening of entertainment far from home. 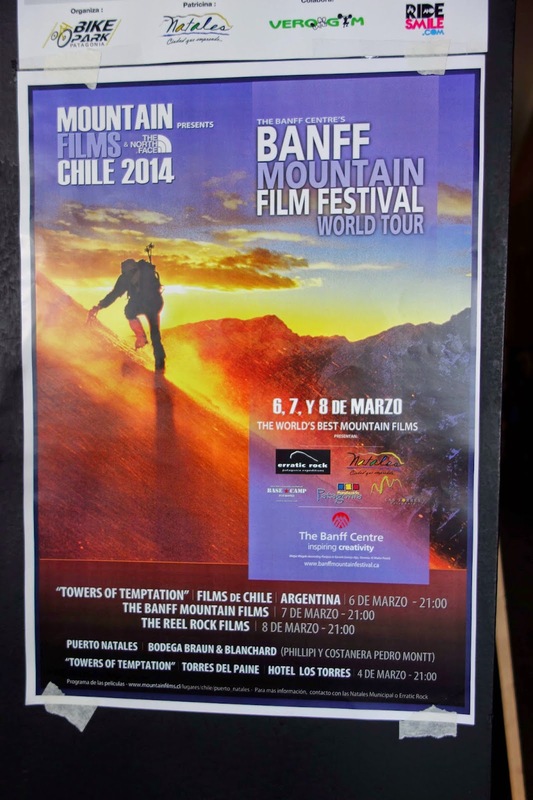 The Mountain Film Festival shows continue throughout the year, even in the coldest days of winter in southern Patagonia. In my last e-mail from Patrick, he wrote enthusiastically of the next showing in Coyhaique, Chile where a Mt. Everest climber and an Antarctica Explorer will be giving lectures along with the films. His timing is good. Travels to Patagonia and other parts of South America are up. And, there’s nothing more exciting than a good mountain climbing story, especially if the mountain is just outside the window.